As part of Beosystem 5500, this advanced tape recorder was as close to professional standard as could be made at the time, bristling with features you just loved to use! There was Auto Reverse, letting you play or record both sides of a cassette as one continuous tape. And automatic adjustment of sound levels avoided annoying volume changes from one recording to the next. 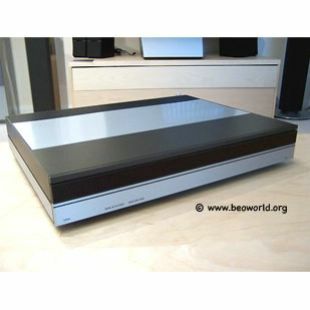 Then there was Bang & Olufsen's famous HX-Pro recording system which gave vastly superior sound quality on the higher frequencies, creating a richer, more detailed sound image. 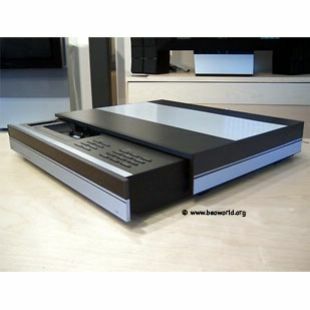 Beocord 5500 automatically adjusted itself to match standard, chrome or metal tapes. You had the option of Dolby B or C during recording. During playback, the recorder automatically switched itself to the noise reduction system you recorded with. Automatic track search was also included - just key in the track number and the recorder did the rest. The cassette recorder could be controlled via the two-way Master Control Panel 5500 as part of the Beosystem 5500. One of the less-pleasant chores in making a recording is setting level control to its optimum position. Setting it too low raises the level of background noise on the recording. Setting it too high makes the recording distorted at high music levels. 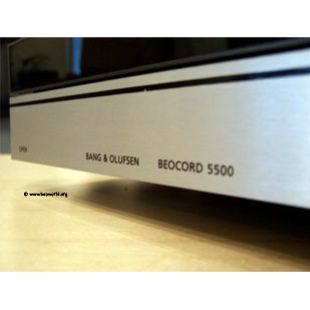 With this in mind, Bang and Olufsen introduced an automatic record mode which was called 'Auto Record'. Auto Record worked in two steps: when the record button was pressed for the first time, the cassette recorder went into a record pause mode, where the incoming signal was monitored. Under microprocessor control, the highest level was monitored and the record level was set at the optimum level for that music. On pressing the record button the second time, the tape was set in motion and the recording started, but continuing to make minor adjustments. If at any time during the recording, the level of music rose above the monitored level, the level control was lowered by exactly the amount required for the new optimum recording level. This method of setting the level control closely imitated the action of a highly skilled recording engineer, if asked to set the level for a recording. It was the best that could be done when the full recording could not be monitored before recording started. This feature incorporated a new method of monitoring the signal, which proved to be a more effective method over conventional methods. It was patented by the company with the patent number 158702.